Anyone else struggle to connect with joy during the cold winter months? Luckily, I’ve been through this enough times now to know that it isn’t due to some specific set of life circumstances. I’m so lucky to have an amazing partner, a loving family, a great job, caring coworkers, and thoughtful friends. I have a home that brings me joy, plants up to here, and enough money to be able to be generous and give lovingly to others. So it’s not situational, thank goodness. It’s science (cue Nacho Libre quote), fortunately — the lack of sunlight makes my brain go a little wonky. However, this wonkiness does tend to affect my life circumstances. I become less social, less motivated, less productive. I eat more carbs. I isolate myself because I’m exhausted from having to be inside my own mind all day. Two winters ago, I remember feeling this way for months. This was before I knew how to articulate anything regarding my mental health, even to myself. Before I knew how to identify the difference between my thoughts and my anxious thoughts. Before I learned to not identify with those anxious thoughts, or judge myself for them. Before I knew that, to some extent, I could do things to make them go away. I’ve learned so painfully much in the last two years about all of this stuff, and yet I’m still an infant in terms of being able to really control any of it. I know how to talk about it now. And I know how to do things about it, kind of. In that vein, I’ve decided to take a “fake it until you make it” approach to creating the joy and the energy that I’ve found myself lacking. One of my favorite podcasts, Happier (by Gretchen Rubin and Elizabeth Kraft), recommends that if you really want to do something, but struggle to motivate yourself to do it, you should put yourself through a “bootcamp” of that thing. A bootcamp is a an intensive, highly focused, short-term way of tackling something. In the podcast, they talked about a holiday shopping bootcamp, or a cleaning house bootcamp. I’m putting myself through a winter happiness bootcamp. I don’t know exactly what this will look like yet, but I’ll make it up as I go. The only rule is that I have to do something every day that is different from my normal winter routine, to create joy and breathe some energy into my life. When it hit me that I was falling into my “winter blues” again, I immediately thought: I need to go to a tropical island. Wait, I can’t do that right now. 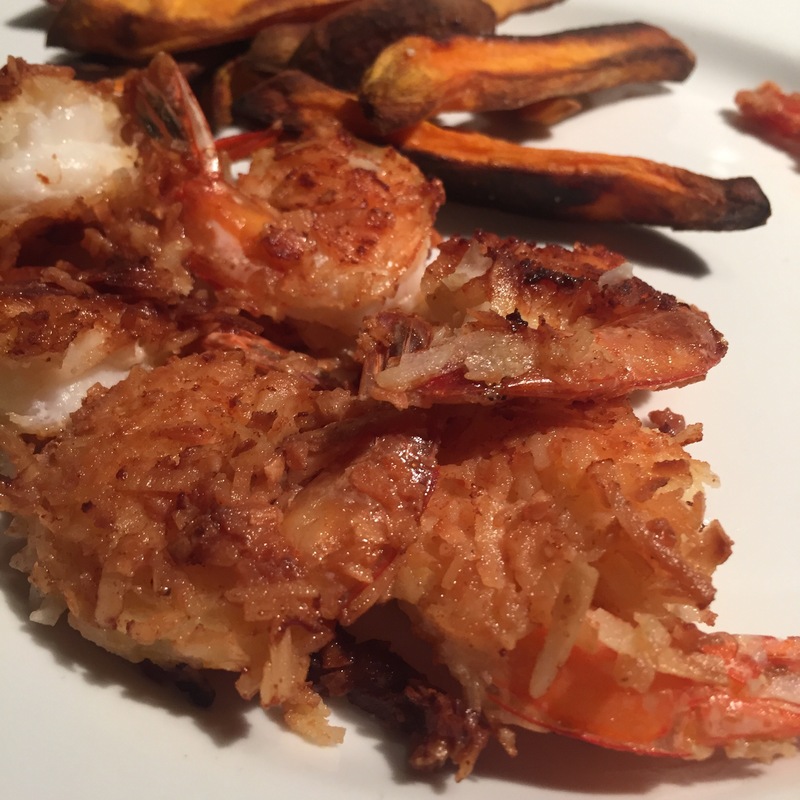 How about coconut shrimp? Close enough. Because you know what you need when you’re in an emotional rut? Crispy stuff. This is a great weeknight recipe because it’s SO easy, but it tastes so festive, tropical, and fun. It’s by no means labor intensive, but it does require you to use your hands, which I always find to be therapeutic. It’s also naturally paleo, gluten- and dairy-free! Hell yeah. 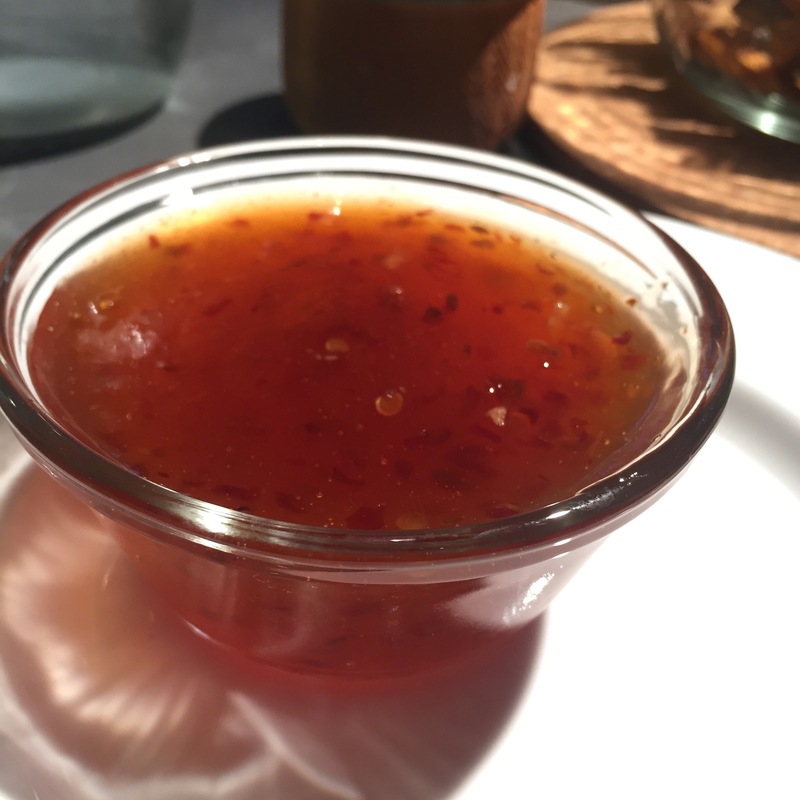 If you’re going to make the yum-tastic dipping sauce below, start it before you make your shrimp, because it takes a little longer than the ninja-quick shrimp. Whisk eggs in a small bowl with a hefty pinch of salt and pepper. Lay coconut on a plate, and create an assembly line: Bowl of eggs, plate with coconut, empty plate for finished product. Dip each shrimp in the egg mixture, then coat in coconut flakes, then place on plate. Repeat for all shrimp. In a large skillet, heat a significant amount of coconut oil (3 tbsp. or so) over high heat. When the oil has melted and is starting to bubble, arrange the shrimp on the pan so that they all lay flat (work in batches if you need to). Allow shrimp to cook until crispy, without disturbing them, for 2-3 minutes, then check one out. When it’s to your desired crispiness level, flip it over. This stuff is the perfect complement to the sweet, crispy shrimp. You can find sambal at most grocery stores, and arrowroot starch at most natural grocers. If you’re wanting to eat paleo-ish and are into Asian cooking, you’ll want to have some arrowroot starch. It works in the exact same way as corn starch, but it’s not a GMO-y corn byproduct. If you want to geek out about it, learn more here. Combine everything except arrowroot starch into a small saucepan. Bring to a slight boil, then simmer until reduced (about 10 minutes). Make a slurry of the arrowroot starch: In a small bowl, whisk the arrowroot starch together with enough warm water to form a paste. Stir the starch into the sauce over lower heat, then keep stirring until it reaches your desired consistency. Remove from heat and serve! Enjoy.